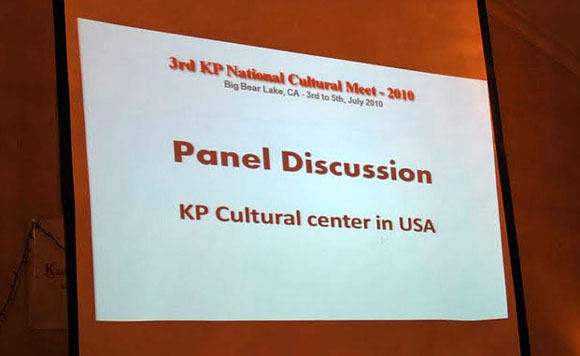 It gives me immense pleasure in reporting about the 3rd KP National Cultural Meet which was held over the long weekend of July 4th at the famous “Big Bear Lake”. After having a great time last year at Lake Tahoe this was an event that all the participants in the west and many others were looking forward to. Even though we had been to Big Bear before but this time it felt as if it was the first time as the KP Camp was a stupendous success. This was one of the joyful and memorable events which everyone who attended is going to cherish for a long time to come. Though the meet officially started in the afternoon of 3rd of July, many of the organizers arrived at the venue a couple of days earlier to ensure that all the participants would be comfortable and all amenities taken care of. This year the event was organized at Western Big Bear Chateau and we had almost 90% of the hotel reserved for our event. We had a huge conference room dedicated for our main event and another conference room with huge kitchen attached was also secured for the event. This was used for our dinner and lunch and also for kid’s activities. The food was prepared by our caterer at the kitchen itself who had setup his own tandoor for hot naan. 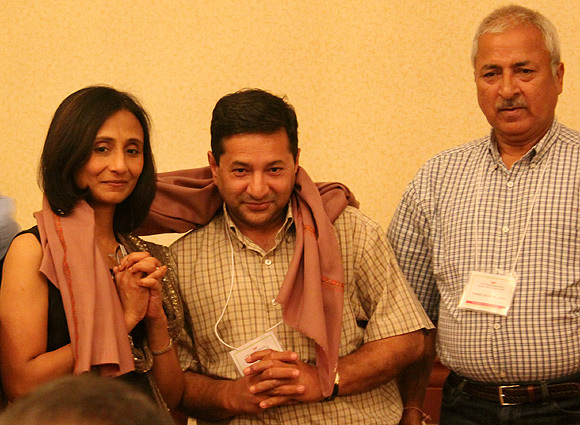 Participant families had come from different parts of California and also from the other parts of US like Nevada, Utah, and Florida and also from India and Canada. There was a mix of all the generations and it seemed as if all had gathered for a big marriage event as it takes place in a Kashmiri family. Participants were warmly received by the welcome team at the specially set up hospitality desk where they were given their room keys and welcome packet that included a beautiful keepsake go green tote bag. That was not all, the organizers had such an eye for detail that they had slipped in personalized welcome letter for each family in their rooms. It really felt as if we were at a corporate conference as the venue was worthy of one. Campers who arrived at the venue, famished after long drives were treated to scrumptious chicken tikka, pakoras and delicious samosas… all that with a refreshing kehwa and then assembled in the Olympian Ballroom where the event started with a warm word of welcome by Dr Jyotika Wali who embraced everyone by her warm and cajoling Kashmiri words of welcome. Then it was the turn of all who were present in the hall to introduce themselves to each other, even though there were some familiar faces but we had some new faces too. One of the highlights of the introduction by almost everyone was that they not only spoke from where they were coming to attend the event but they also spoke about the place from where they actually came from Kashmir. Participants were given introduction of Mrs Sushma Kalla who had come all the way over from India to enthrall the audience with her melodious voice. Over the next two days she would be entertaining everyone with the mix of Kashmiri songs, Bhajans and also Hindi songs and Ghazals. After doing the brain exercise everyone in the audience wanted something different so to relax them all and to get the fun element in the evening there was a nice laughter filled short Kashmiri Skit Titled “Dr Huttie Muttie” which was presented and acted by Paviter Handoo and Rajeev Sumbly. It was a nonstop roller coaster ride of laughs and everybody was laughing like there is no tomorrow. After the laughs it was the time of kids to rise and shine. There were many kids who were very eager to get onto the stage and perform whatever they had prepared and in the end we saw the talent of kids in singing, playing Piano, dancing, even showing the martial arts. It was really a pleasure to see little kids singing Kashmiri songs it shows that they are keen in knowing about their roots. 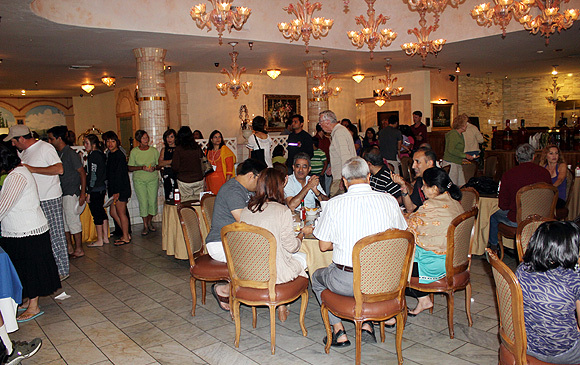 After the scintillating and mesmerizing performance of kids a sumptuous dinner was waiting for everyone. There was a separate bar setup in an adjacent room. By 10 PM almost everyone was done with the dinner and drinks and everybody assembled back in the main hall where Mrs Sushma Kalla was getting ready to enthrall the audience with her melodious singing. The evening went on till well beyond midnight and everyone in the room seemed to have lost the track of time. After SushmaJi’s performance it was time for everyone to hit the dance floor with our own DJ Ankit handling the music no one wanted to stop but it then knowing what was in store the next day we had to end the night which was around 2AM. The day started with a hot breakfast in the Le Bistro restaurant by the lobby and everybody assembled outside the main entrance of the hotel, there was a bus waiting to carry us all over to the shores of Big Bear Lake where a cruise boat was arranged for a two hour long trip in the lake. This was reminiscent of the Doonga ride which every Kashmiri is familiar with from way back in Kashmir when families would board shikaras and would spend the day in Dal Lake. 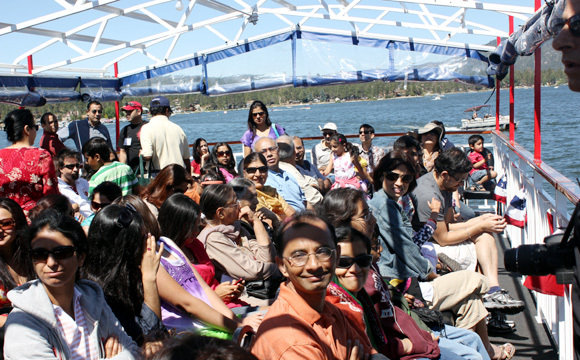 Everyone was on board the liberty cruise ship after a brief introduction by the captain of the ship the microphone system on the ship was handed over to us and once again Sushmaji started her songs this time she was accompanied by many participants who were show casing their own singing talents. The two hours on board went by pretty quick and we would have continued for some more time if the boat would have been available. We were all back by 12.30PM and hot lunch was waiting for all of us at the hotel and everybody had lunch and started preparing for the reminder of the day. There was a panel discussion after lunch which was attended by seniors and youngsters of our community equally. The discussion started with a slide show by Deepak Ganju showing the plight of Kashmiri Pandit houses in Kashmir after the exodus in 1990. The slide show was heart rending and almost everybody present there had their eyes moist. The topic for the discussion was regarding the setting up of cultural center which had been initiated in the last year camp. Everyone present there put forth their ideas and finally the discussion concluded with the setting up of different groups which would see that this dream of having a first cultural center of Kashmiri pundits in the world of its kind be set up. More details about this center would be released by the committee members at appropriate times. Around the time when elders were busy with the panel discussion, Kids activities were organized in the lawns of hotel alongside the swimming pool. They were organized by Mrs Monica Rangroo Dhar. All the kids participated in various games and also some of them enjoyed the swimming at the pool. After the kids activities and the panel discussion everybody gathered in the lawns for a memorable photo session in the traditional Kashmiri bride and bridegroom dress. This is one for the albums and everyone had great time in clicking these pictures. 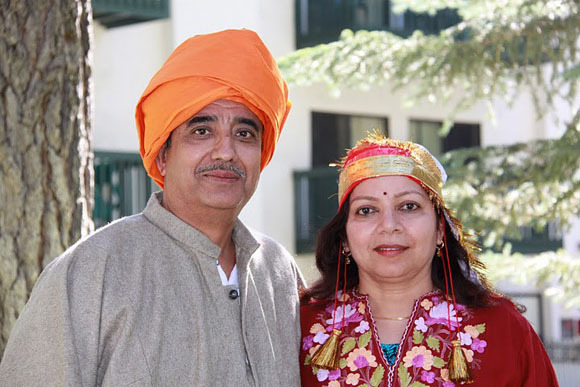 While the pictures were being clicked there was background music of Wanwun which would be sung during marriages in Kashmir and this was courtesy Dr Kuldip Thusu who got his car next to the lawns and played the music at high volume which created the ambience of a Kashmiri marriage. All the participants then went back to prepare for their participation in the Kashmir Got Talent – 2 which has been the brainchild of Naveen Dhar. In line with the "Connect to Kashmir" theme of the Meet, all participants were divided into teams, named after various places in Kashmir like Verinag, Pahalgam,Tulmul, Sonmarg, Shankaracharya, Cheshmashahi etc. Snacks and tea was served at the same time, snacks comprised of fresh hot pakoras of chicken, paneer and vegetables. After the snacks everybody again gathered in the main hall and the KGT -2 got underway and there was complete participation by all the members, some came up with Jokes, some with songs and some even danced to some peppy bollywood number but the first prize went to Verinag group who presented a small skit where in a Kashmiri pandit represented by Inder Kaw is going back to Kashmir after many years of Exodus and meets up with his Kashmiri Muslim friends who are quite excited to receive him back in Kashmir after so many years. KGT – 2 was followed by a super dance performance by the several ladies participants who came dressed in authentic Kashmiri dress of Pheran which were arranged by Paviter Handoo and all the participants got to keep the pheran. 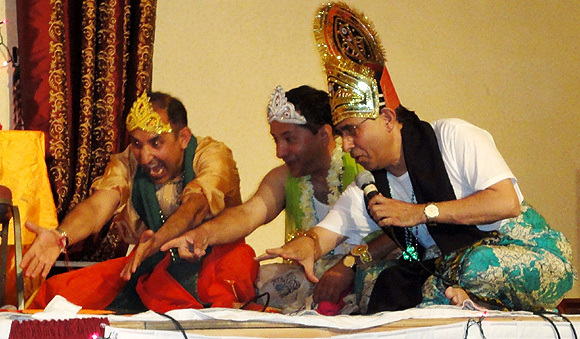 They mesmerized everyone in the audience with their dance on a very popular Kashmiri song Bhumbroo Bhumbroo. Right after the Dance performance one of the highlights of the evening, Interpretation of Draupadi Vastra Haran act from Mahabharata presented in Kashmiri language with a comic flavor which was presented by Mr. Deepak Ganju from Florida and directed by his better half Mrs. Chandramukhi Ganju. It was one of the most anticipated items of the evening as all the characters in the act except Mr. Deepak Ganju were novices and to get them all together in a single day was exceptional. This act was made more authentic as all the actors were wearing costumes which were provided by Deepakji and Chandramukhiji who had got them all the way from Florida. 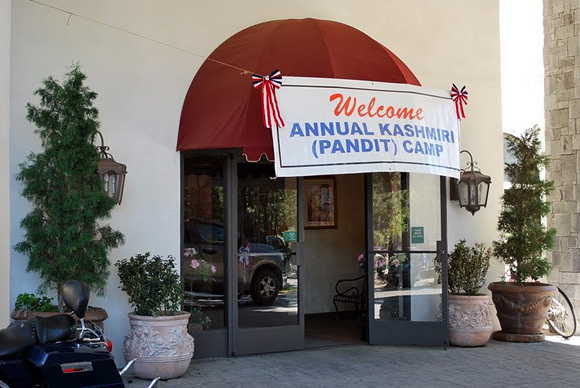 During the evening Dr Amrit Nehru came up to the stage and introduced Dr Kuldip Thusu of Fresno CA who had been supporting the camp from the very first year with his donations even though he had never personally made it before to the earlier editions of the camp. Dr. Kajori Thusu and Dr. Kuldip Thusu were felicitated with a shawl which was presented by Mr. Uday Kumar Aima on behalf of all. Dr. Thusu was very modest in his brief acceptance speech just said “Tohye chiv myeon khoon” (You are my blood). Also there was a special presentation of awards to kids who had participated in the arts contest which was held the previous day. Top three winners of the Art contest were felicitated by the organizers and as a special gesture to promote the talent of kids all the three top winners work will be displayed in the coming issue of Shehjar and the 1St prize winners work will be displayed on the front page of Shehjar. The winners were First prize: Sandhya Tiku, Second Prize: Diya Kaul and Third Prize: Yuvika Salman. All other kids were also given prizes for their contribution in showcasing their talent during the kid’s performances. This was followed by introduction on Daileep Langoo’s CD – OMKAAR NAAD and Book singing by Chandramukhi Ganju, author of Koshur Saal. There was a break for dinner then and after having mouth watering dishes in dinner everybody got back to the hall for another scintillating performance by Mrs Sushma Kalla, this time she was also joined by Dr Rakesh Safaya who played “Tumbhaknaari” -a traditional Kashmiri drum used during marriages- in a Maenzraat style singing session. Few others joined her on the stage later to perform with her some nice Kashmiri songs. 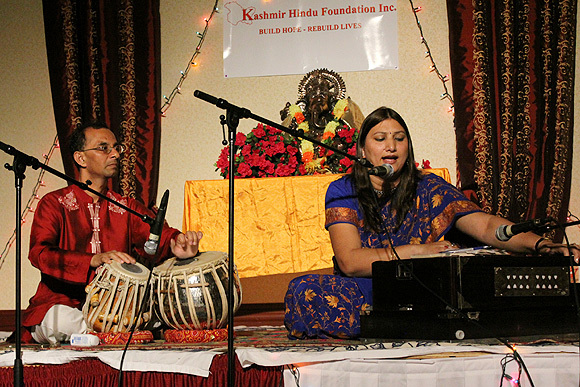 She thrilled the audience again with renditions of bhajans, songs and ghazals in both Hindi and Kashmiri. She went again well beyond midnight. Later on the stage was thrown open to other talented singers from the audience and there were few who came forward and sang few songs and ghazals accompanied by Sushmaji on Harmonium and Hemant Ekbote on tabla. The night continued with the people from audience coming forward and singing along with Karaoke. There was lot of hidden talent which came forward and it went on till almost into the wee hours of the morning. Even few kids were up late and enjoyed the songs and dance. As is said that “All good things must come to an end.” so did the 3rd KP National camp. Everybody started gathering in the lounge of the hotel in the morning where breakfast was being served and people started saying goodbyes to each other as people wanted to beat the rush hour later who had travelled from far off distances. No one wanted to leave and wanted more but then we all promised to meet next year. Our deep gratitude to Mr. Deepak Ganju (CA) for part sponsorship of Music segment through his organization- Merrill Lynch and a generous family that offered funds to have our own music system for such events. Seeing these clips of the event brought tears in my eyes and the words of Dr. Thusoo "Tohye chiv myeon khoon (You are my blood)" seems to be my words too. Thanks Monica Ji to you and to your team. Monica's exquisite chronicle makes me think again about how much fun we had at the meet. Excellent narration! Congratulations to the whole team for the successful conclusion of the whole show.Narration of Aankhun Dekhi kept me glued to my seat. In my reveries while reading the mail, I enjoyed the camp as one its active participants. Er.Monica Aima-Salman seems to have become a professional emcee. What a selection!Marvelous! All of you along with all around be blessed with a virtuous, healthy, prosperous and long life free from any vices. Tathasto! Saw the pictures and videos. Beautiful place and well organized event!! I have gone through the July Edition of "SHEHJAR". The contents are quite inteesting. The main attraction is the photograph with our brothers singing the famous song" YI SHAMI GAM ROZIA NA ROZIA, YEMEN ZULFAN YI KHAM ROZA NA ROZA". Apologies for late acknowledgement being away to Britain, Scotland and Northern Ireland. May God bless you with more and more energy to bring out the issue month after month. What a great way to celebrate our cultural heritage. Kudos to organizers for such a great effort. would like to attend the next event.